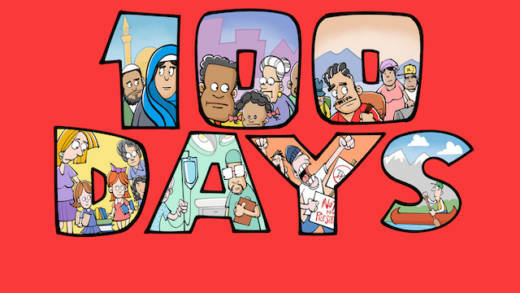 KQED Arts is calling on Bay Area artists of all ages to contribute to their series “First 100 Days: Art in the Age of Trump” to help capture this moment in American history. Since FDR, a new president’s first 100 days have served to define the incoming administration, setting the stage for upcoming changes and challenges. The “First 100 Days” series asks artists to respond to this historic time, which runs from the inauguration through April 29. According to KQED’s senior arts editor Chloe Veltman, the hope is to publish a continuous stream of digital content focusing on issues that matter to artists and voters alike, such as the economy, immigration, and the environment. Ideally, submissions will address issues rather than simply lampooning political personalities or their appearance. For inspiration, check out our video about creating political art, which features the work of internationally known artists like Banksy, Ai Wei Wei and Shepard Fairey. Students of all ages are encouraged to submit their work (use the submission form below).